HomeBasketballMixed Juice: Who starts for the 2019-20 Syracuse basketball team? Syracuse coaches look on during play. Mandatory Photo Credit: Kicia Sears, The Juice Online. With the basketball offseason underway, The Juice Online’s Saugat Sen and Wes Cheng look toward the 2019-20 team. 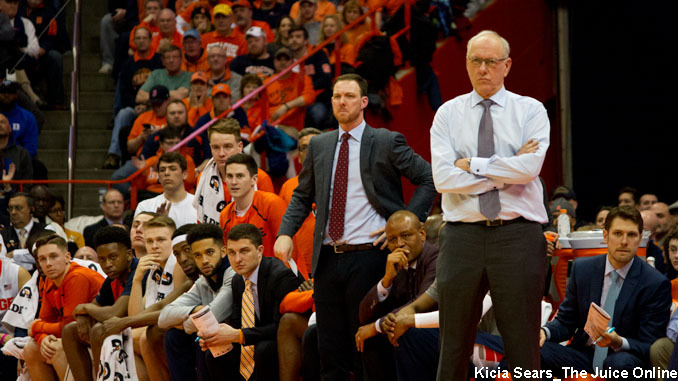 Today’s topic: Who is going to be starting for SU next season? WES CHENG: Saugat, now that we are officially into the basketball offseason, let’s look forward to the 2019-20 season. Who do you have as your starters this upcoming year? Now the Sidibe starting spot is something I am questioning even as we talk. And maybe even the Buddy Boeheim one. WC: I can see why you’re questioning the Buddy decision because I don’t think Buddy will be in the starting lineup. In the upcoming season, Syracuse has a lack of proven depth at guard. Buddy was in the rotation last season, but Carey was benched for the majority of ACC play. Behind them is a list of unprovens: Howard Washington. Joe Girard. Brycen Goodine. The easy way to resolve this is to move Elijah Hughes from wing to guard. Wing depth is a strength for the Orange with Brissett, Marek Dolezaj and Quincy Guerrier, and potentially Robert Braswell depending on his development. In this lineup, Buddy comes in as the “instant offense” guy off the bench. Jim Boeheim has traditionally liked a sixth man with that kind of skill set. You left off questioning your inclusion of Sidibe. Are you thinking Dolezaj starts over Sidibe at center? SS: I think Boeheim likes continuity when setting his starting lineup. If he looks at the set of players coming back, Buddy is the player he turned to every time either of his starting guards, Frank Howard or Tyus Battle, were unable to play last season. I do agree with the lack of depth at the guard position and the ability of Hughes to play guard. The way Boeheim uses Hughes is to start him at the wing, and then put him at guard depending on the game flow. Either way, Hughes will be playing big minutes in 2019. As to your last question, Dolezaj would be a great center. He showed flashes of brilliance as a passer, has a developing jumper and is all around gritty. Unfortunately at 180 pounds, he will likely be the lightest center in the ACC. We all know what happened when he took a charge against Zion Williamson. If Dolezaj can gain 15-20 pounds of muscle, he will easily start at center over any other option. WC: That’s true on Buddy. I also think that, as the coach’s son, Boeheim has a bit of blinders for his Buddy and gives him a longer leash. Boeheim stuck with his son even as he struggled through the non-conference portion of the schedule whereas he was more willing to jettison Carey’s minutes as he started to struggle. And perhaps there’s a sense of pride there that he raised a son who is now a Division I starting guard. But I’ll still stick to Boeheim liking instant offense off the bench, and what’s exactly what Buddy gives him. As for Dolezaj, he’s eating a pizza a day and is still a beanpole. As much as we’d like to think he’ll gain that magic 15-20 pounds over the summer, the reality is that he’ll gain five (if we’re lucky), and we’ll still be in the conundrum of having to limit him to only 10-15 minutes at center. I think that will lead Boeheim to keep Dolezaj on the bench, able to sub in at wing or center as needed. Syracuse needs someone to become the “alpha” now that Battle has moved on. Who do you see that being? SS: I think Carey makes the biggest jump. His athleticism and raw talent reminds me of Michael Carter-Williams. Similar to Carey, Carter-Williams struggled his freshman year at Syracuse, averaging only 2.7 ppg, 2.0 apg and 1.5 rpg. Very similar to Carey this year who averaged 3.5 ppg, 1.0 apg and 1.6 rpg. We all know the huge jump MCW took in his sophomore year, averaging 12 ppg, 7.3 apg and 5.0 rpg, allowing him to eventually jump to the NBA. Who is your guy to take the next step, and do you see anyone outside of the group we discussed as a dark horse candidate for the starting lineup? WC: I think it’ll be Hughes. He was already the team’s second leading scorer at 13.7 ppg and has a similar skill set to Battle. With Battle gone, Hughes will likely swallow up some of the shots Battle took last year. If he can sure up his dribble, I could see him averaging over 16 ppg. As to your second question, the one guy who is a complete dark horse for the starting lineup is Jesse Edwards. He just committed last week, and appears to have as polished an offensive game as we’ve seen from a Syracuse center in quite some time. We’ve already discussed the center position as being fluid, and with his skill set, the opportunity is there for him to overtake Sidibe in the starting lineup. Not only does his addition give more depth to that position, but would allow Dolezaj to stay more at wing.